Chow and Chatter: Guest Post: Persian Beef Stew and Bon Voyage! I want to share a little of my Persian heritage with you all and so I have decided to bring you some recipes over the next few weeks (for the rest of the recipes you can go to foodepedia.co.uk), in the hope that I can introduce you to the wonderfully diverse and authentic cuisine of the country in which I was born, Iran. This is one of the most popular stews from my home land and it really is hearty and moreish. I would be lying if I said I was raised on it as my family weren’t the best of home cooks per se, but having broken that tradition, I want to share this fantastic recipe with you. It’s a real family dish, made at parties or as one pot meal for the whole family. I hope you like it as much as I do. Using a large heavy based cooking pot over a medium heat, add your olive oil and diced onions and soften the onions until translucent and cooked through and then turn the heat up to high. Add your beef and fry the meat for about 5 minutes, ensuring you constantly keep the meat moving, to avoid ‘stewing’ it in the pan. Add your turmeric and stir the meat making sure it gets an even coating of turmeric. Do the same with the saffron and cinnamon, then add your two tablespoons of tomato puree and give the meat a good stir and cook the tomato puree through for about a minute. Then pricking your dried limes several times with a fork, add them to the pan, along with your yellow split peas, chopped tomatoes, lemon juice, bay leaves and water. Stir the pot well and then reduce the heat right down to a very low temperature and slow cook the stew for a minimum of 3 hours and then serve with basmati rice. 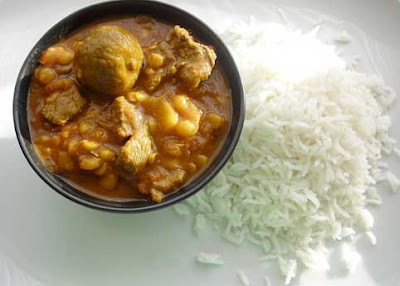 This stew tastes even better the following day when, as we Iranians say “Jaa oftadeh”, which literally means “It has fallen into place” and the flavour have really fused together and created an ever thicker and richer sauce to enjoy. The only problem is, you may not be able to wait that long! If you do manage to wait until the following day, don’t be afraid to add a little boiling water from a kettle, to revive it’s sauce content. But don’t go overboard as it will thin out the flavour if you overdo it. A mug of hot water is often all you need! So bye for you everyone, we fly to the UK tomorrow will take snaps and collect recipes along the way, oh and meet some food bloggers!!! GREAT look recipe!! Perfect for these cold days. This looks like a great recipe! This past weekend, I went shopping for garam marsala (for the first time! ), and brought back home several other curry spice mixes so that I can start making recipes that are featured on this blog - it's about time! I even found "Omani" limes at this store. It's so exciting for me! Hi there! I just wanted to thank you for all the great blogposts and let you know I have awarded you the Over the Top award for your blog! Check out my blog post for more info :) Keep up the great posting! fresh local and best: oh thats so cool see what food blogging does to you!! I absolutely ove Persian food! Great recipe! Have a safe and happy trip! We look forward to your snaps and yoru adventure stories! Jenn: oh yeah fish and chips Jasmines first exciting! Velva: thanks so much I so need to try it and I am meeting Sabrina in London !! The recipe sounds so delicious and comforting! Have a safe and fun trip Rebecca! You and Jasmine are so cute! Thanks for sharing. I don't know much about Persian cooking, and I just learned about dried limes! That looks delicious! And hope that you have a wonderful trip with your family. Looking forward to your next posting! Yum! I love Middle Eastern spices and flavors. This looks quite fabulous with the cinnamon and saffron. Thanks for sharing! Have a safe trip filled with tons of delicious food! This looks like a family meal that is very comforting. oh that looks so comforting and delicious! Have a great time,Rebecca!That recipe sounds delicious!!! Have a great time! Traveling for food and meeting food bloggers....I'm very jealous. Delicious stew! Have a wonderful trip! Very interesting recipe...bet it's wonderful on a cold day! thanks for the article on staying slim during the holidays...looks great! have fun and m loving this recipe! What a perfect recipe for a chilly evening! Have fun across the pond and can't wait to see the photos! Looks super delicious, have some dried lime in my pantry and now I can put them into good use. thanks! Gorgeous bowl of soup, must be just delicious & flavorful! Have a great & safe trip in UK! Oh this is on my list to try! I've sat down for a relaxing trip to the U.K. (via your posts, of course, lol!) Can't wait to read of your travels! Here I go! !